Other times, though, you want a burger that’s not a burger. 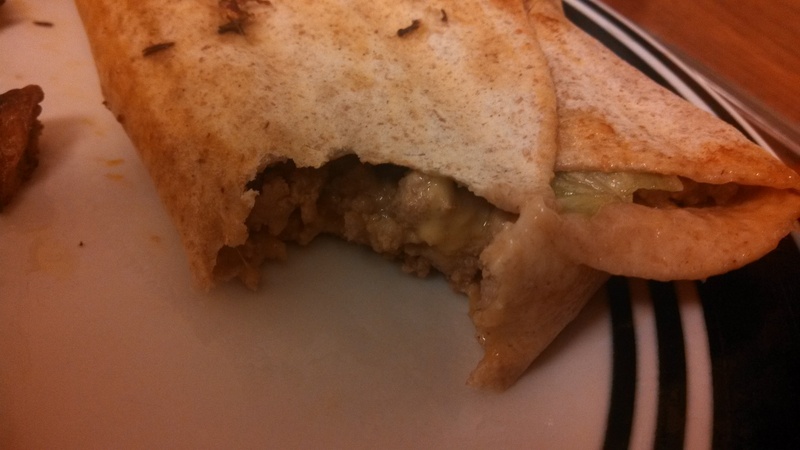 That is where these cheeseburger wraps by Six Sisters’ Stuff comes in. It was partially because we only have a single lone bun sitting in the freezer (how’d that happen? 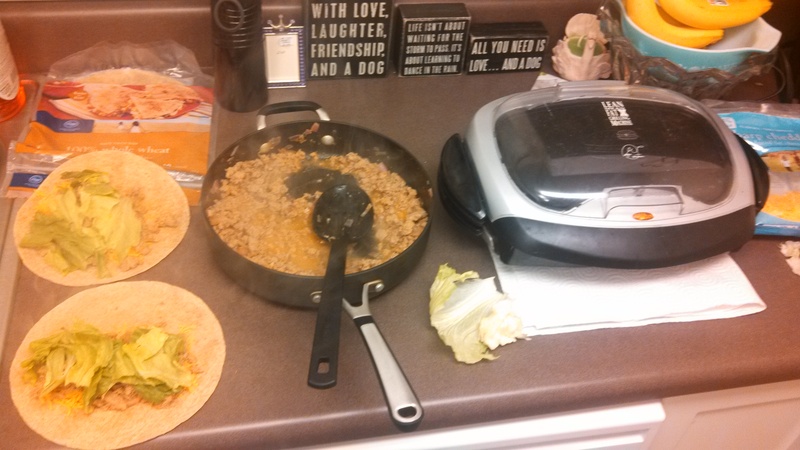 ), but also cuz we had a ton of random leftover tortillas still sitting around. 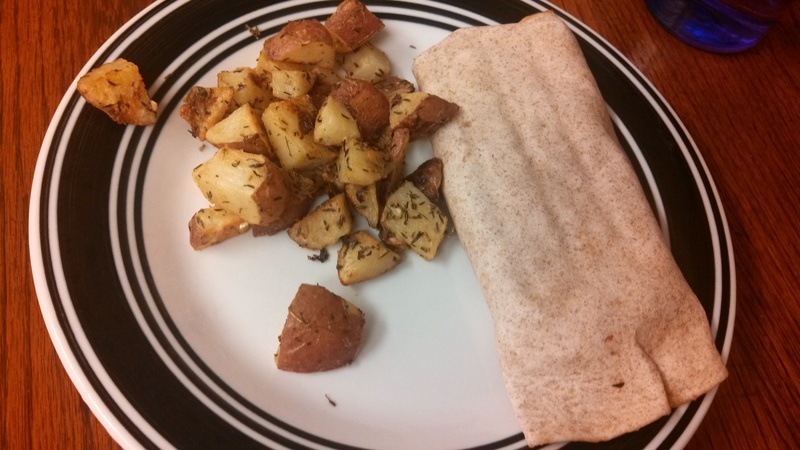 These wraps are super quick and easy, which is something I’m trying to master for weeknight meals (so often my recipes seem to take 45+ minutes), but these definitely came together fast! I used our George Foreman grill, which didn’t really work the greatest, to be honest. I couldn’t find the drip pan, so I used paper towels instead, which proved to be quite messy. I also forgot to drain the meat, and even though I used a slotted spoon to dish the meat mixture onto the tortillas, it was still pretty liquidy, which ran down the sides of the grill, which led me to take them off the grill quicker than I might have otherwise, therefore the pictures of my wraps don’t have the nice grill marks that the pictures in the original blog do. I also decided that I needed to use up the last 3 red potatoes I had in the cupboard, so I quickly jumped on Potatoes board on Pinterest (but of course) and found this roasted dijon potatoes recipe from I Thee Cook, also quick and easy recipe, to throw together before starting the wraps. They were SO YUMMY. Sometimes potatoes can be dry or boring in my opinion, even when spiced up, however these were anything but! They were so full of flavour and a great addition. 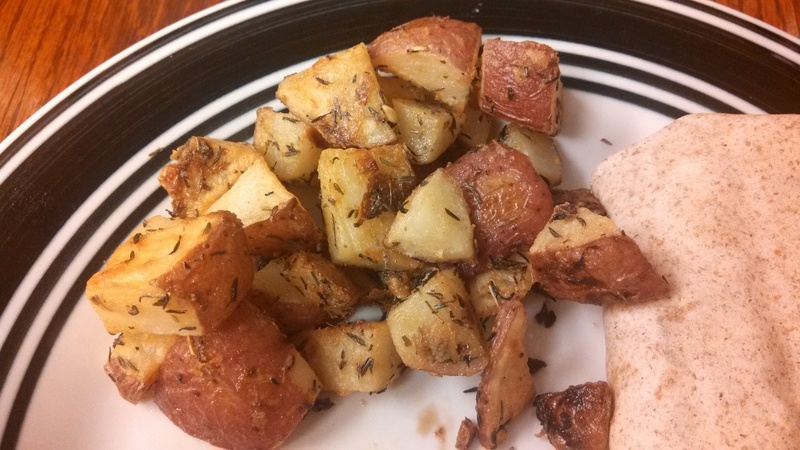 The recipe called for yukon gold potatoes, but I used red potatoes – and still turned out lovely. Even the phone on my camera was able to capture the yummyness! But the outcome was still delicious! And it tasted exactly like a cheeseburger. Yum. -In a large skillet, brown hamburger until no longer pink. Add ketchup, mustard, onion, Worcestershire sauce, and salt and pepper and cook for about 2 minutes, until all combined. -Take a tortilla and line the middle with a small amount of cheddar cheese. 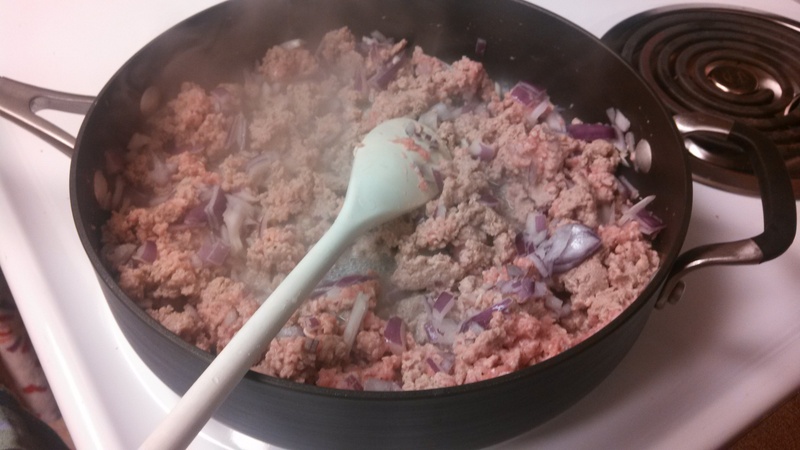 Add some cooked meat mixture and then top with your favorite hamburger toppings. -Roll the tortilla up and tuck in the ends (like a burrito). -You can either eat as is or throw on a grill (or even an indoor grill- like a George Foreman grill) for 3-5 minutes (just until you see grill marks). -Place all ingredients in a bowl and toss together. -Place in a baking dish or a parchment lined baking sheet for a crisper potato. Bake for 30 to 40 minutes and serve hot.